Artemisinin, one of three active ingredients from the plant species Artemesia, has found fame in fighting malaria; but it can also kill pathogens, yeasts, about a third of parasites and, importantly, cancer cells; indeed, there is actually an Artemisinin Cancer Protocol which we detail in this overview. Artemisia annua, or Sweet Wormwood, is a herb found from Pakistan to China, and is the current treatment of choice for malaria. The highest concentration of active ingredient is found in the leaves and flowers. There are 14 other Artemisia species. It was originally used in Traditional Chinese Medicine where it was called Qing Hao. The species Artemesia has a number of active derivatives - artemisinin and analogs artemether and artesunate being the three most commonly used. Malaria kills at least 1 million people across the world each year. Artemisia annua, or Sweet Wormwood, is the most effective treatment, especially as the potency of certain drugs has continued to fail. The exact understanding of how it works is not fully clear but it seems to attack the membranes of the malarial mitochondria, the power stations inside the parasite(1). It came to the fore in the swamps and rain forests of the Vietnam war. The Viet-Cong used it to beat malaria. The Americans took their pills. An analysis at a much later date showed that aremisinin was causing the damage against Plasmodium from the malaria. Infections and excesses of yeasts are common in humans in the West. Some 70 per cent of human have excesses of yeasts at some point in their lives. Excesses are caused when the commensal bacteria of the gut (the good guys) are compromised and fail to deal with the yeasts. At night in a healthy individual, 2.2 pounds of yeasts are consumed by commensal bacteria. Without their presence, the yeasts can flourish. They can punch holes in the gut wall (Leaky Gut Syndrome) allowing food molecules into the blood stream, resulting in fatigue. In worse cases the yeasts can get into the blood stream, blocking cell receptor sites and colonising certain areas of the body reducing localised oxygen levels. The helpful gut bacteria can be damaged and their numbers reduced, by antibiotics and drugs (especially Proton Pump Inhibitors). They can also be damaged by changing the pH of the gut – through smoking or consuming too much sugar, salt, pickled food or alcohol. The most damaging effects come from stress. Wormwood seems to act in two ways against yeasts(2). As above, it attacks the mitochondrial membrane by producing free-radicals. It also interferes with ATP-dependent calcium transporters in the mitochondria. Artemisinin is very effective at killing yeasts, typically it can be used to treat excesses of Candida albicans in humans(3). Typical symptoms of yeast infestations include bloating, flatulence, gut problems, thrush, cystitis, mouth ulcers, night sweats and more. Artemisinin can be effective in treating IBS, Crohn’s and Small Intestine Bacterial Overgrowth, or SIBO, the underlying cause of illnesses such as fibromyalgia, for example. 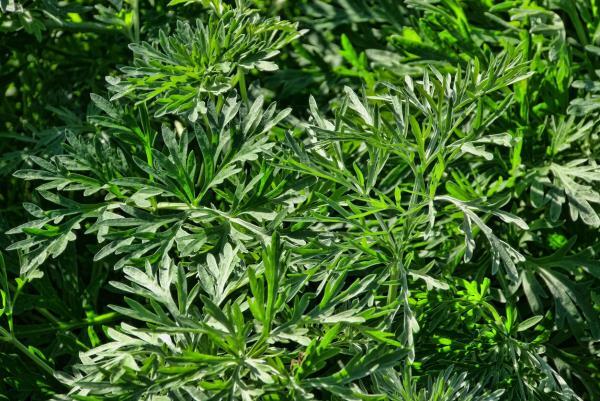 Firstly, artemesia annua is very effective at killing a group of blood flukes or Schistomas. These are the second most common parasite in the world after malaria. They are Trematodes. Later it was discovered that all trematodes can be killed by artemisinin(4). Pinworms, roundworms and more. When killing parasites, artemisinin seems to act on 124 different targets at the last count(5). It acts in so many ways it is actually a super-herb. One of artemisia annua’s properties is its sesquiterpines, which play a huge role in human health. Research shows they reduce inflammation and tumour formation(6). Some are anti-microbial and disrupt the cell walls of funghi and invasive bacteria. E.coli has now been found present in UTIs, and in breast cancer, bladder cancer and colon cancer tissue. So the above antimicrobial action makes artemisinin a potent cancer preventer. And research has shown artemisinin does kill microbes from E.Coli to Salmonella(7). Artemisinin has also been shown to have an effect against HPV induced cancers. At least two studies show it can kick out HPV from the body; this could have significant implications for cancers in the cervix and throat. Go to: Can Artemisinin kick out HPV cancers? Artemisinin is fast becoming an alternative cancer therapy. In particular , artemisinin seems to have anti-tumour effect against aggressive cancers, like brain, colorectal, pancreatic and TNBC. There is clear research from Dr. Henry Lai and his team at the University of Washington that artemisinin kills cancer cells on its own, or especially when bound to iron(8). Cancer cells love iron and so they ingest the iron with the artemisinin bound to it. When bound to iron artemisinin is 34,000 times more effective at killing cancer cells! Much early work was done by this Doctor. He noted that artemisinin might provide a safe, non-toxic alternative cancer treatment, especially in cancers which had little response to chemotherapy. In early work with Dr. Singh, they found that artemisinin could selectively kill breast cancer and leukaemia cells, and back in 2001 they were already using it with cancer patients (see below). They showed that when artemisinin came into contact with iron, a high level of free radicals formed, killing the cell. Cancer cells are rapidly dividing out of control and so take in a lot of iron. So back in 2001 Lai pumped up the iron levels in cancer patients and then used artemisinin to attack. Lai also found better results with more aggressive (rapidly dividing and thus more in need of iron) cancers like leukaemia and pancreatic cancer. A Dr. Hoang first started treating cancer patients with 500 mg of artemisinin twice a day in Vietnam and claimed to have a 60% ’cure’ rate. Fortunately there are newer studies in the Western World too that seem to back this up to a degree. They are now a number of studies showing artemisinin is effective against cancer. For example, artemisinin causes cancer cell death (apoptosis) in pancreatic cells; patents have been applied for so that it can be used in a trial with leukaemia, artemisinin and its derivatives have been shown to be extremely effective against Non-Small Cell Lung Cancer (NSCLC) preventing metastases, invasion and inhibiting cancer stem cells; and it also attacks iron metabolising systems in breast cancer cells and has been proposed as a ’chemosensitiser’. There is a 2009 study that shows it can stop prostate cancer cell progression especially from lymph nodes (9). There is also a scientific review paper that reports on the use of artemisinin to block oestrogen induced cell progression in breast cancer (10). According to studies published in journals like Life Sciences, Cancer Letters and Anticancer Drugs, wormwood can kill off cancer cells at a rate of 12,000 cancer cells for every healthy cell in the body. Artemisinin also appears to activate Natural Killer cells in the immune system. This effect was shown in 2017 research to cause more cancer cell death in ovarian cancer. Another derivative of Artemisia, artesunate, was used in 2015 in a preliminary 20-person, double blind, randomised clinical trial by Dr. Sanjeev Krishna and a team from St. George’s London. The group taking artesunate had far larger numbers of colorectal cancer cell deaths and were far more likely to survive to month 42 when the follow up was completed. A clinical trial with Colorectal cancer patients is now underway. Professor Han-Ming Shen at the University of Singapore has also shown an effect for artemisinin with colorectal cancer. In a second stage of research, they further enhanced artemisinin’s activity with Aminolaevulinic Acid (ALA). Artemisinin and ALA together killed even more colorectal cancer cells while having no effect on healthy cells. Liver cancer is the next cancer to be studied. Since many cancers are precursored by gut problems, long-courses of antibiotics, or drugs for recurrent illnesses, artemisinin is always a herb to consider. 6. An Artemisinin Cancer Protocol? It is interesting to review Dr. Narendra Singh's paper on artemisinin in cancer treatment. He wrote this from the Department of Bioengineering, University of Washington, Seattle. The artemisinin molecule contains an endoperoxide bridge that reacts with ferrous iron to form free radicals. Cancer cells have a very high iron uptake and the high volume of free radicals therefore kill the cell. In his first study (1995) on lymphoblastoid leukemia, the cancer cells were killed in just 8 hours. The effect on healthy lymphocytes was calculated to be 100 times weaker. Another study on breast cancer cells, again with iron (holotransferrin) plus artemisinin showed 98% of the cancer cells killed in 16 hours, and no effect on healthy cells. In a real case study on a man with Larynx cancer, the artemisin had a significant tumour reducing effect within two months, increasing both quality of life and survival time. In human experiments, the researchers use a reduced diet, supplemented with vitamin D and C and encouraged exercise. The vitamin C encourages ferric iron in the blood to convert to ferrous iron in the cancer cell, and encourages greater uptake. Singh believed vitamin C should thus be taken after meals. The supplement glutathione should not be taken as it reduces the effectiveness of artemisinin. The Artemisinin was given at night before bedtime as they said that in the night the immune system was at its weakest and cancer and bacterial cells proliferated more. Blood levels are higher in females with peak concentration in the blood for men and women after 90 minutes. Artemisinin can cross the blood brain barrier. It should not be used when undertaking radiotherapy nor for a minimum of two weeks after as radiation increases the uptake of iron in healthy cells. It should not be used if people smoke. So, how much artemisinin should you take if you have cancer? An 80 kg male should take approx 600 mg a night. Much of the human trial work on cancer involves doses of between 500 and 800 mg per day. Even before bed, it should be taken with a little food and ideally a little fat or oil. Several studies on breast and prostate cancer involved the patients taking artemisinin for 6 to 12 months. However, Wormwood is powerful stuff, although anti-malarial doses have shown few side-effects. Please be aware of possible side-effects, especially if you have a weakened or fatty liver.